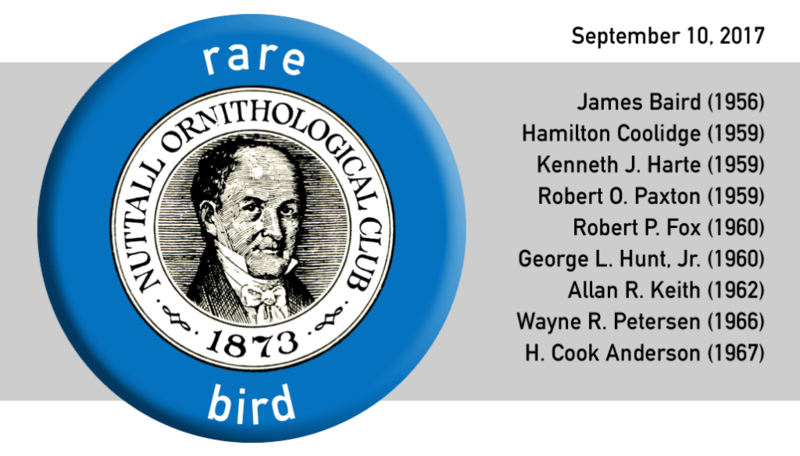 On September 10, 2017, the Nuttall Ornithological Club was pleased to honor our Members who have been with the club for 50 or more years with a luncheon and reception, followed by a visit to the collections in the Ornithology Department at Harvard. This is an amazing group of individuals who have been not only stalwart Members, but mentors to many club Members, inspirations to others, and outstanding educators, researchers, and public figures. So we were not just honoring longevity, but decades of significance and merit. In addition to our nine 50+ year honorees, we took the opportunity to honor two Nuttall Pioneers. Kathleen (Betty) S. Anderson has been a Member since 1974, and an Honorary Member since 2008. Deborah V. Howard has also been a member since 1974. Betty and Deb were two of the first female Nuttall Members and Betty was the first female President of the Club. They have truly been inspirations to all.